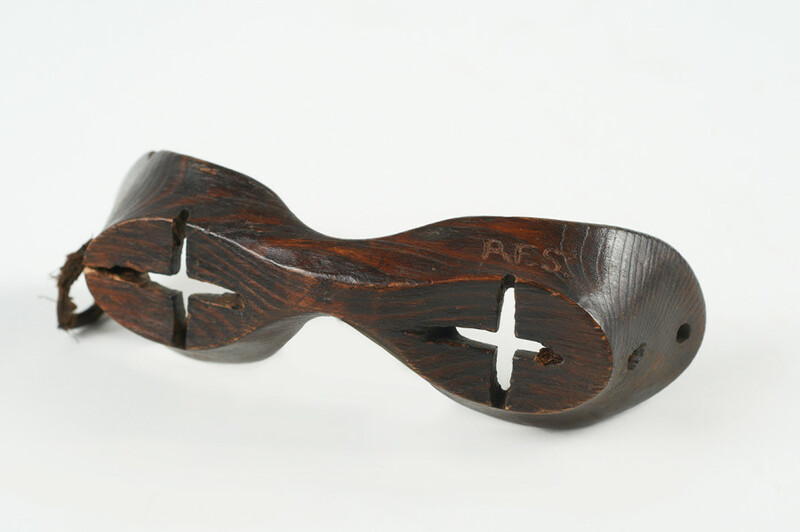 Snow goggles, wooden, with a cross cut across each eye to provide some degree of visibility, small holes were pierced at each side so that they could be tied on with leather straps. This pair belonged to Captain Robert Falcon Scott, his initials ‘R.F.S.’ are carved into them on the top side. He used them during the National Antarctic Expedition 1901-1904. Goggles like these were essential when trekking through such hostile terrains as the Antarctic with explorers often exposed to conditions such as ‘snow blindness’. This was caused by the intense glare of sunlight reflecting off the snow, burning either the corneas or any exposed skin; leaving the men with blistered faces and often unable to see.